Nationwide’s 5th annual Advisor Authority study reveals the underlying causes of investor concerns. Louisville, KY—April 9, 2019—As April 15th approaches, and the reality of the most dramatic tax reform package in nearly three decades becomes clear, the Registered Investment Advisors (RIAs) and fee-based advisors who say that the majority of their clients will benefit from tax reform have declined 10 percentage points—to 69 percent in 2019 from 79 percent in 2018. This is among a preview of results from the fifth annual Advisor Authority Study commissioned by Nationwide Advisory Solutions, formerly known as Jefferson National. Taxes are considered a cause of market volatility by advisors, are rated a top-three financial concern by investors, and both say that taxes will be among the top factors to adversely impact investor portfolios over the next 12 months, according to this latest survey of nearly 1,600 RIAs, fee-based advisors and individual investors conducted online by The Harris Poll. Investors remain less confident about tax reform, with just 53 percent of all investors in 2019 saying they will benefit as compared to 56 percent of all investors in 2018. One of the biggest shifts in investors was among the Ultra High Net Worth, with those who say they will benefit from tax reform declining nearly 10 percentage points—to 65 percent in 2019 from 74 percent in 2018. To alleviate clients’ anxiety about the impact of tax reform, the vast majority of RIAs and fee-based advisors have been taking action, with 75 percent in 2019 and 79 percent in 2018 saying that they have adapted their approach to tax-advantaged investing in response. Year-over-year, RIAs and fee-based advisors rate taxes among their clients’ top financial concerns and say that their clients’ level of concern is increasing. RIAs and fee-based advisors say that taxes rose to a number-two concern for clients in 2019, from a number-three concern in 2018, a number-four concern in 2017, and their number-six concern in 2016. Likewise, investors also say that taxes are among their top financial concerns year-over-year and that their level of concern has increased. 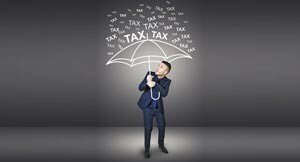 Investors rated taxes as a number-two financial concern in 2019 and 2018, rising from a number-four concern in 2017 and number-three concern in 2016. RIAs and fee-based advisors say that taxes are the number-five cause of volatility, and taxes are inexorably tied to portfolio performance, with both advisors and investors alike citing a negative impact. When asked what macro factors will most adversely impact their clients’ portfolios over the next 12 months, RIAs and fee-based advisors rated taxes number-three in 2019 and 2018, rising from number-five in 2017 and 2016. The fifth annual Advisor Authority study explores the investing and advising issues confronting RIAs, fee-based advisors and investors—and the innovative techniques that they need to succeed in today’s complex market. It features a special focus on the most successful advisors and the most affluent investors. These initial findings are to be followed by a series of ongoing reports that will be released over the next 12 months. The fifth annual Advisory Authority Survey was conducted online within the United States by The Harris Poll on behalf of Nationwide Advisory Solutions from February 15 – March 4, 2019 among 1,021 financial advisors and 824 investors, ages 18+. Among the 1,021 financial advisors, there were 507 Registered Investment Advisors and 514 Broker/Dealers. Among the 824 investors, there were 205 Mass Affluent (Household Investable Assets of $100,000 to less than $500,000), 205 Emerging High Net Worth ($500,000 to less than $1 Million), 207 High Net Worth ($1 Million to less than $5 Million) and 207 Ultra High Net Worth ($5 Million or more). Advisors are weighted where necessary by employment status and active management to bring them in line with previous years’ profile. Investors are weighted where necessary by age by gender, race/ethnicity, region, education, income, marital status, household size, investable assets and propensity to be online to bring them in line with their actual proportions in the population.